Every 40 seconds, two and a half gallons of water flow into the basement of a New Jersey home. The source of the flooding remains a mystery. Rana Novini reports. A deluge of water has been wreaking havoc on a New Jersey home for years, its owners say. A deluge of water has been wreaking havoc on a New Jersey home for years — and the source of the flooding remains a mystery, its owners say. Approximately two and a half gallons of water flow into the basement of the home in Summit every 40 seconds or so, homeowners Gerard and Penelope Garcia told News 4. The Garcias haven't been able to figure out where the water is coming from, they say. Problems started plaguing the home in May 2014, when water flooded the Garcias’ basement, destroying valuables and leaving a mess behind. The homeowners cleaned the basement up, but issues with flooding persisted, they say. 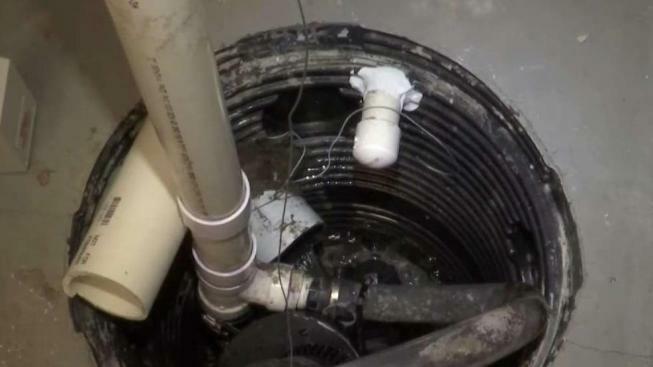 The problem was temporarily mitigated when their water company fixed broken pipes at a condo complex situated above their home, but this past November, water started flowing again — at buckets a minute. “We don’t know who to turn to to help,” Penelope said. At first, the water was draining into their neighbor’s yard, so the Garcias dug a trench through their own front yard and installed a pipe so water could flow out into the street, they said. That didn’t, however, solve their biggest problem — determining the source of the water. The Garcias have since hired lawyers and inspectors in an attempt to get answers. They also tried to get help from city leaders by posting signs on their front yard. “Over 70,000 Gallons of water down our drain!! Does anyone care?” one of the signs read. “As our company is not the cause of the water issue, unfortunately there is simply nothing else we can do,” the spokesperson added. The Garcias hope calling attention to the problem will help them find a solution. “We cannot leave. We’re prisoners in our own house,” Gerard said.